Grammy Gertie's Recipe Box: MERRY CHRISTMAS!! Every year, my family throws a neighborhood Christmas Eve party for our primarily Jewish neighbors. It involves a lot of food, alcohol, and pointed questions, like, "Amanda, I hear that the local film industry is failing. What are you going to do for work now?" There will be latkes, Christmas cookies, chips, dips, little bowls of nuts, and hot cider on the stove. Our neighbor will tell her adult daughter that she's "had enough to eat", and my sister will be told repeatedly that she's "had enough wine." The three sons of our Irish Catholic neighbors will slyly drink enough to walk into trees/shrubs/telephone poles on the 100yd journey home. Everybody has a great time. 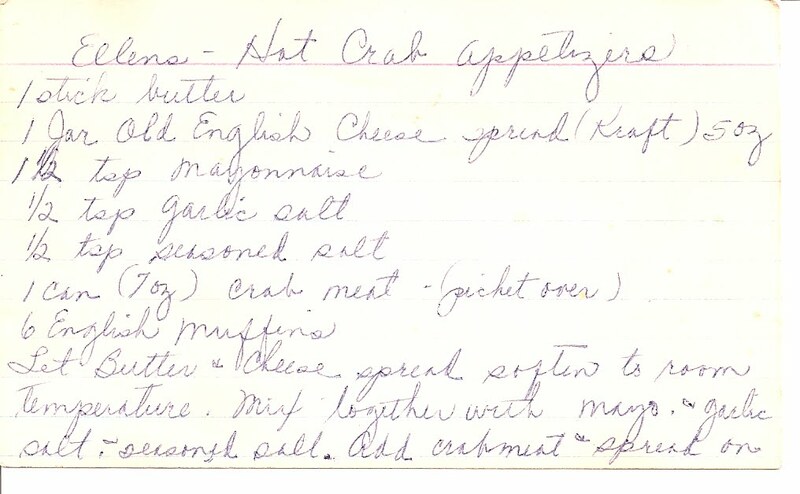 Today's Christmas Eve recipe is actually made by my mother and served at the above-mentioned party. Grammy Gertie liked it so much, that she started making it too. -Let butter and cheese spread soften to room temp. -Mix both together with mayo, garlic salt and seasoned salt. -Spread mixture onto English muffin halves. -Cut each half into 8 triangles and broil until bubbly.